Dec. 11, 2012: If you're outdoors after sunset this week, be alert for meteors. Not only is the Geminid meteor shower active as Earth passes through a stream of debris from "rock comet" 3200 Phaethon, but also, say forecasters, a new meteor shower could make an appearance. "The source of the new shower is Comet Wirtanen," says Bill Cooke of NASA's Meteoroid Environment Office. 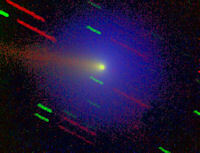 "Dust from this comet hitting Earth's atmosphere could produce as many as 30 meteors per hour." Comet Wirtanen was discovered in 1948, just after World War II, and takes 5.4 years to orbit the sun. It reaches its closest point to the sun just outside Earth's orbit. Although this comet has skirted Earth's orbit many times, Earth has not run into its debris streams before. 2012 could be different. Computer models run by Russian forecaster Mikhail Maslov predict as many as four stream crossings between Dec. 10th and 14th. "This time period also includes the peak of the strong annual Geminid meteor shower," notes Cooke. To sky watchers, he recommends having a "meteor night" after sunset on Dec. 13th, when the criss-crossing debris streams could produce the greatest combined number of shooting stars. "Meteors from the new shower (if any) will be visible in the early evening, with the Geminids making their appearance later on and lasting until dawn," he says. The new shower doesn't have a name yet. Before naming it, astronomers will wait to see if it is real. If any meteors do materialize, they might be called "Piscids." The shower's radiant is located in the constellation Pisces, according to Maslov's dynamical models of the debris stream. Maslov also predicts that the meteors will be very slow moving, which should help novice sky watchers distinguish them from the faster Geminids. is available for the Geminids. Meteor hunting on Dec. 13-14 is a no-lose proposition because, as Cooke points out, even if the new shower is a dud, the Geminids should be great. With no glaring Moon to spoil the show, observers in rural areas should be able to see as many as 120 Geminid meteors every hour. The best time to look is during the dark hours before sunrise on Friday, Dec. 14th.